Only three days after their road upset of UC San Diego, the Sonoma State men's basketball team was back in La Jolla looking to pull consecutive upsets over the Tritons, who came into the CCAA Tournament as the No. 2 seed and the No. 23 team in the country. The Tritons overcame a tremendous overtime performance by James Davis to score the final six points, handing the Seawolves a heartbreaking 71-66 loss to end their season in the CCAA Tournament quarterfinals. 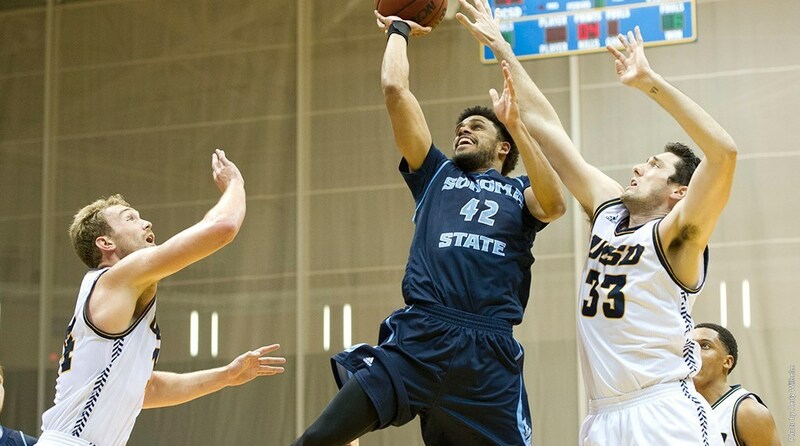 James Slade scored a team-high 13 points and David Ahern added 10 as the Sonoma State men's basketball team pulled off a nailbiting 74-72 upset victory over No. 19 UC San Diego in La Jolla on Feb. 27. The Seawolves (14-12, 9-11 CCAA) will be the No. 7 seed in the CCAA Tournament and will head back to La Jolla on Tuesday for a rematch against the No. 2 seeded Tritons in the opening round of the conference championships. A three-pointer by James Davis with 9:31 left in regulation capped an 8-0 run and put the Sonoma State men's basketball team down by just three points, but the Seawolves would be held without a field goal the rest of the way, allowing host Cal State San Bernardino to run away with the 83-69 victory on Feb. 26 at Coussoulis Arena in San Bernardino. In the final game of their collegiate careers, seniors Hannah Sourek, Taylor Acosta and Tanner Adams scored 18, 12 and 5 points, respectively, but the Sonoma State women's basketball team suffered a 75-62 loss to No. 20 UC San Diego in the regular season finale for both squads on Feb. 27 in La Jolla. The Seawolves see their season come to an end at 10-19 overall and 5-15 in the CCAA. Kylie Kiech scored a team-high 14 points and Jerrica Crosby scored nine of her 13 points in the second half as the Sonoma State women's basketball team earned a convincing 57-48 upset victory over Cal State San Bernardino on Feb. 26 at Coussoulis Arena in San Bernardino. A pair of tremendous starting pitching performances and two big innings at the plate helped the Sonoma State baseball team to a doubleheader sweep at Seawolf Diamond against the Cal State Dominguez Hills Toros on Feb. 27. In non-conference road action against CCAA North Division foe San Francisco State, Sonoma State took a 6-1 loss to the Gators at Maloney Field on Feb. 23. Ryan O'Malley continued his torrid pace to begin the season by ripping an RBI double to center in the first to give Sonoma (3-9) a 1-0 lead, but that would be all the offense the Seawolves would produce. Carlie Daniel went 4 for 5 with a double, two walks and three RBI and Amanda Llerena earned a complete-game shutout win in the opener as the Sonoma State softball team swept visiting Cal State Monterey Bay, 6-0 and 4-2, in the CCAA doubleheader on March 1 at the Seawolf Softball Field in Rohnert Park. The Seawolves have won their last four games, and six of their last seven, to improve to 10-6 overall and 7-3 in CCAA action. Trailing 3-0 with two outs in the bottom of the seventh inning and with just a runner on second base, the Sonoma State softball team rallied for four runs on a two-RBI triple by Alison Strycula and a two-RBI walkoff double by Jordan White in the first of two victories for the Seawolves on Feb. 27 over visiting Cal State East Bay at the Seawolf Softball Field in Rohnert Park. Jena Kaser smashed her second home run of the season in the first inning of game one, and it proved to be the difference in Sonoma State's 5-1 series-opening victory before visiting Cal State East Bay responded with a 4-3 win in game two as the teams split the doubleheader at the Seawolf Softball Field on Feb. 26. Sarah Rotter dropped in her second-career hole-in-one on Feb. 23 en route to a three-over par 73 in the final round, good for a two-round total of 148 (+8) and a tie for third place overall in the St. Edward's Invitational at Orion Creek Club in Austin, Texas. Rotter paced the Sonoma State women's golf team to a third place finish out of 15 teams with a score of 611. The Sonoma State men's golf team cruised to its second straight win in as many weeks, an eight-shot victory over host and runner-up Cal State East Bay at the Tim Tierney Pioneer Shootout at Hiddenbrooke Golf Club in Vallejo on March 1. It is the Seawolves' third win in seven tournaments thus far in 2015-16, the most since the 2009-10 campaign. The Sonoma State men's golf team captured its second victory of the 2015-16 season, taking first at the Feb. 23 CSUSB Coyote Invitational at Arrowhead Golf Club in San Bernardino. Nicolas Daniels led the Seawolves with a third place finish after carding a one-under-par 212 (68-74-70) for the tournament. The Sonoma State men's tennis team will have to wait a little bit longer for their first win of the season as 16th-ranked UC San Diego rolled to a 9-0 win at the Northview Courts in La Jolla on Feb. 26. It was the ninth consecutive loss for the Seawolves, who were ranked 9th in the latest ITA west region rankings. The Sonoma State women's track and field team opened its 2016 season on Feb. 27 at the Johnny Mathis Invitational hosted by San Francisco State at Cox Stadium. The Seawolves saw several personal records achieved in the field events while sprinter Angelique Lopez finished fifth out of 21 competitors in the 200 Meter Dash.